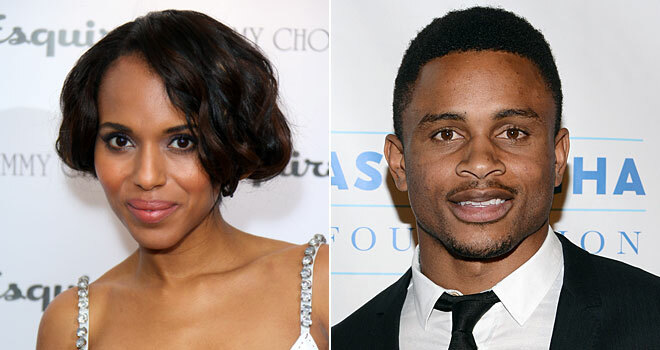 Actress Kerry Washington, 36, secretly married Nnamdi Asomugha, a cornerback for the San Francisco 49ers on June 24th in Blaine County Idaho. The isolated location was sure to keep the paparazzi away. Their relationship until now had remained a secret. Apparently the couple had been dating since last summer. NNamdi Asomugha, 31, had played in the NFL for the Oakland Rainders for eight seasons and for the Philadelphia Eagles for two seasons before joining the San Francisco 49ers. He has also landed a few acting roles in shows such as "Friday Night Lights", "Kroll Show", and "The Game". This is the first marriage for both. Washington had been previously engaged to boyfriend David Moscow (the kid who turned into Tom Hanks in the film "Big"), but the wedding was cancelled im 2007.